As of JRebel for JDeveloper 2018.2.5, remote server support is available as an experimental feature. We are eager to receive any feedback and thoughts - please send them to support@jrebel.com! JRebel remote server support will enable instant code reloading for setups where your IDE and application server are running on different machines. Typical scenarios are that your application server is running remotely on a network server, on a local virtual machine, or in Docker. The JRebel IDE plugin will send your changes over the network to the remote server running your application (we call this the remote synchronization). The IDE plugin will keep track of your workspace state and always send just the latest changes. This avoids having to repackage and re-upload the entire application after every change. The JRebel Agent running on the remote application server will then update your application with the latest changes, skipping the redeploy. This chapter lists the steps required to set up JRebel remote server support for JDeveloper. You need a working, activated JRebel installation in your IDE. 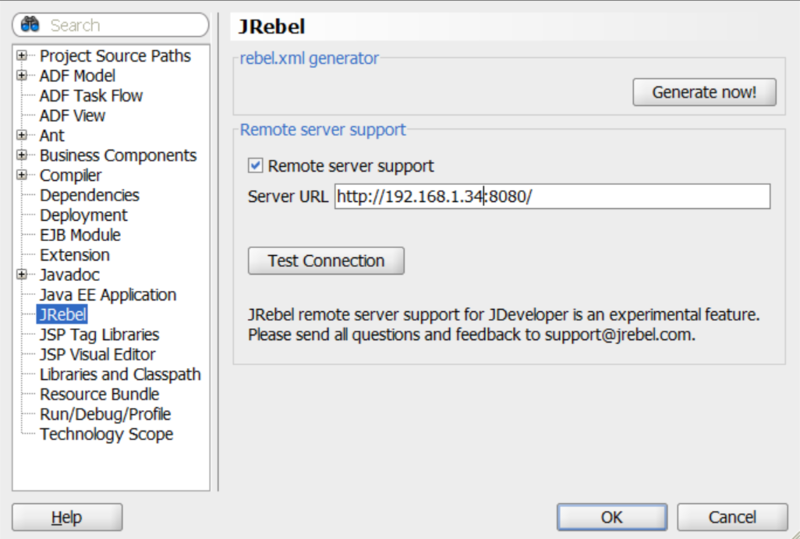 Please follow the instructions on how to install and configure JRebel for JDeveloper. If you have already set up JRebel, move on to step 1. You will now need to provide the URL of your server to your IDE. You can do this under Project Properties. Once you enable remote server support, a rebel-remote.xml file will be added to your project. You will now need to build and deploy your application to the remote server, making sure that this generated file is also included in the artifact. You can now synchronize your changes with the remote server by clicking the Synchronize button on the main toolbar.